A PARISH priest in north Mayo has told a Bórd Pleanála hearing into the controversial Corrib gas project that his community has been a victim of “tarnished and untrusted holders of political office”. Speaking during the closing statements on the 20th day of the resumed hearing into the last section of the pipeline, Fr Michael Nallen said “politically this project has been through unsafe hands”. He cited in particular former taoiseach Bertie Ahern’s involvement after planning appeals board inspector Kevin Moore turned down the then configured project in 2003. Fr Nallen also said certain “media outlets . . . connected to the oil industry have blocked access to the means of expression for those who have genuine reasons to be concerned about the impact of the project”. WARNING: "Waiting for Superman," the new film by David Guggenheim ("An Inconvenient Truth"), might be injurious to public education. The Bord Pleanala Corrib gas oral hearing in Belmullet will run into its fifth week with closing submissions expected to start today (Tuesday) and the process is expected to conclude at the end of the week. The oral hearing into Shell E&P Ireland’s application for the last section of the Corrib high pressure gas pipeline was expected to take three weeks to complete but has been extended on two occasions. TWO men were arrested after they halted drilling work by Shell in Sruwaddacon Bay last week. On Wednesday afternoon three members of the Rossport Solidarity Camp mounted one of the drilling platforms at low tide. They remained there all night and were provided with food and water by other protesters. There was no drilling work being carried out at the time and gardai did not intervene. The damage and destruction is over for now!!! Activists originally occupied the flyover of the Shell garage at 122-156 Walworth Road, Camberwell, London, around 3pm on 25/09/10 [Pics] The occupation was in solidarity with the people of Rossport, County Mayo, Ireland, who are resisting Shell's destructive influence, and all those experiencing repression at the hands of this brutal multinational oil company. 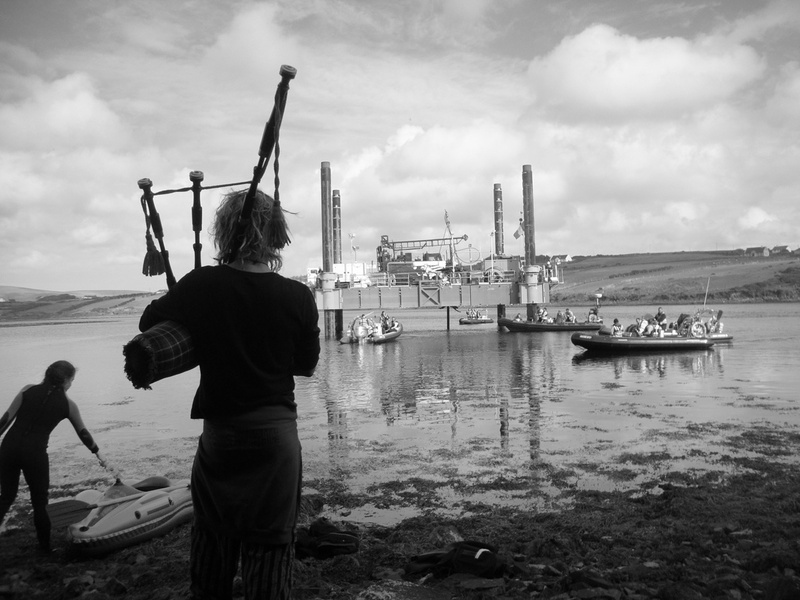 This Monday, 20th September two Shell to Sea campaigners tied themselves to a drill on one of Shell's platforms, and remained up there stopping work for a total of 12 hours, from 7am to 7pm. An article in the edition of August 26th, concerning the Corrib gas project, stated incorrectly that waste chemicals from the gas processing terminal at Bellanaboy will be discharged 80kms off the Mayo coastline. What will be discharged to sea is treated produced water. The Environmental Protection Agency, in issuing its emission licence, said there is no potential for harm to the marine environment from the treated produced water. 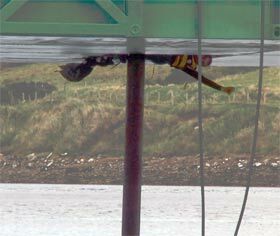 A spokesperson for the Rossport Solidarity Camp described how an occupation of a Shell drilling platform was brought to an end when the last campaigner was removed when "a Garda climbed out to him with a commando knife and no harness or support gear to hold himself up.